The OBX Swim Club located in Nags Head, NC is seeking a Head Swim Team Coach for its year-round USA Swimming program. The OBX Swim Club is a USA Swimming Level 1 swim club that currently has over 40 short course and long course swimmers. The team swims at the Nags Head YMCA. The Head Coach will supervise all aspects of the program under the direction of the parent board. Responsibilities include, but are not limited to, writing and running workouts, season planning, managing the Team Unify database and website, maintaining the roster, meet entries, attending monthly board meetings, tracking athlete performance, fundraising including an annual open water swim and swim-a-thon, communicating with parents, and budgeting. The ideal candidate is an energetic, positive leader who is capable of being highly effective in an independent setting with a wide range of swimming levels from 8&U beginning swimmers to Junior National level swimmers. Candidates must have USA Swimming coach certification and ASCA Level 3 certification or higher. Applicants must have current background checks and athlete protection course completed and current. Starting date is August, 2016. Salary is commensurate with experience and team size. Submit cover letter and resume to barrettcrook@kittyhawkengineering.com. • Member in good standing with USA Swimming and current with all background checks and certifications. • ASCA Level 3 certification (or equivalent) desired. • Ability to communicate proper stroke technique instruction and development, dry land conditioning, and taper strategies for all levels of swimmers. • Familiarity with Team Unify. The Outer Banks is a premier outdoor water sports recreation destination visited by millions every year. As the Birthplace of Flight and home to the Wright Brother’s Memorial, The Lost Colony, Jockey’s Ridge and Cape Hatteras National Seashore the area is a playground for the outdoor lover. From hang gliding and kite boarding to fishing and sightseeing, the Outer Banks has some of the best beaches in the United States and is home to the historic towns of Manteo, Nags Head, Kill Devil Hills, Kitty Hawk, Southern Shores, Duck, Corolla and numerous other surrounding communities. Please visit https://www.outerbanks.org/ for more information. Swimming Coach Certified or willing to do so within 30 days. If you are interested in advancing your certification, please sign up to be evaluated. If you have any questions, you can contact Mark Frank at 919 796 9908. To learn more, please visit the National Certification Program from USA Swimming. Team Charlotte Swimming is looking for an additional assistant coach for our 10&Under group. This is a part-time position, and compensation is based on experience. For more information on NC Swimming Job postings, please visit our Job Postings page. Description: Hillsborough Aquatic Club Swim Team seeks qualified & passionate Head Age Group swim coach for the upcoming season. HAC is a year-round USA Swimming team based out of the Orange County Sportsplex. Applicants must be USA Swimming Coach Certified or willing to do so within 30 days. There will also be some administrative work accompanying this role. Applicant should enjoy working with school aged children/teens. They are responsible for planning and executing practices, providing professional swim instruction, encouraging and supervising participants, interacting with children and their families, and creating an enriching, fun, and safe environment. The candidate must have a positive attitude and be willing to serve as a role model to participants in the program. To apply, please e-mail resume and at least 2 professional references to Head Coach Clifton Gordon at cgordon@oc-sportsplex.com. Description: Hillsborough Aquatic Club Swim Team seeks qualified & passionate part-time Age Group swim coach for the upcoming season. HAC is a year round USA Swimming team based out of the Orange County Sportsplex. Part-time Coaches are required to work 3 to 5 nights per week and will be required to attend 1-2 weekend competitions per month. Applicants must be USA Swimming Coach Certified or willing to do so within 30 days. Applicant should enjoy working with school aged children/teens. They are responsible for executing practices, providing professional instruction, encouraging and supervising participants, interacting with children and their families, and creating an enriching, fun, and safe environment. The candidate must have a positive attitude and be willing to serve as a role model to participants in the program. Aquatic Team of Mecklenburg (ATOM) is currently seeking an energetic, knowledgeable and passionate part time age group swim coach for our site in the Southpark area of Charlotte, NC. Applicants should be able to write practices, administer dryland workouts, complete meet entries, attend meets, and communicate with parents. Applicants will also be responsible for the development of 12-14 year old athletes and creating a culture of care and hard work. The coach would be on deck five days a week and an average of one meet per month. Wage based on experience and expertise. ATOM is a growing club located in Charlotte, NC with athletes ranging from National qualifiers, Sectional and State Champions to developmental swimmers. ATOM has a rich history of producing athletes who have competed on the collegiate, national and international level. The team currently has just over 120 swimmers, and is focused on creating an environment where all swimmers can be successful. Interested applicants should send their resume and three references to: ATOM attn: Shaynah Jerrell, 1026 Leigh Ave, Charlotte NC 28205 or email to shayrayunc@aim.com. Carolina Aquatic Team, a year round USA Swimming team, seeks qualified, passionate part-time age group swim coaches for various sites in the greater Chapel Hill / Durham NC area for the upcoming season. Part Time Coaches are on deck between 2 and 5 nights per week, plus an average of one weekend competition per month. Applicants must be USA Swimming Coach Certified or willing to do so within 30 days. To apply, please email resume and at least 3 professional references to Head Coach Josh Weaver at carolinaaquaticteam@gmail.com. The OBX Swim Club located in Nags Head, NC is seeking a Head Swim Team Coach for its year-round USA Swimming program. The OBX Swim Club is a USA Swimming Level 1 swim club that currently has over 40 short course and long course swimmers. The team swims at the Nags Head YMCA. The Head Coach will supervise all aspects of the program under the direction of the parent board. Responsibilities include, but are not limited to, writing and running workouts, season planning, managing the Team Unify database and website, maintaining the roster, meet entries, attending monthly board meetings, tracking athlete performance, fundraising including an annual open water swim and swim-a-thon, communicating with parents, and budgeting. The ideal candidate is an energetic, positive leader who is capable of being highly effective in an independent setting with a wide range of swimming levels from 8&U beginning swimmers to Junior National level swimmers. Candidates must have USA Swimming coach certification and ASCA Level 3 certification or higher. Applicants must have current background checks and athlete protection course completed and current. Starting date is August, 2016. Salary is commensurate with experience. Submit cover letter and resume to barrettcrook@kittyhawkengineering.com. Todd Webber presenting Anne Marie Schneider, Vincent DeCaro, and Craig Whitaker with hardware for completing the journey. As of May 1, 2016, USA Swimming has a rule change affecting Timing Adjustment Procedures going forward. The new rule affects how Admin Officials, Referees, and Scoring Operators are to handle Lane Malfunctions going forward. 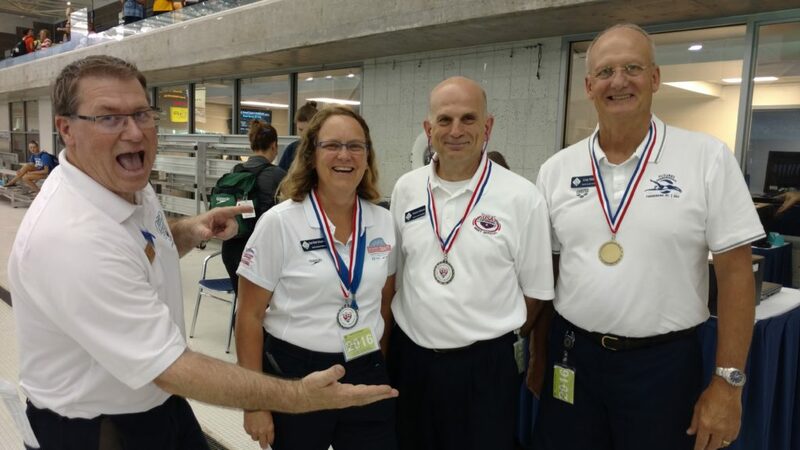 Colleen Gillan – North Carolina’s Officials Training Coordinator put together a handy Quick Guide to USA Swimming Timing Adjustments Rule Change to help answer any questions. Remember that the rule goes into effect as of May 1, 2016 so all meets going forward will be subject to the new rule change. The rule just affects how Lane Malfunction are handled. The procedure for handling Heat Malfunctions will not change. If you have any questions, please feel free to reach out to your Zone Reps.